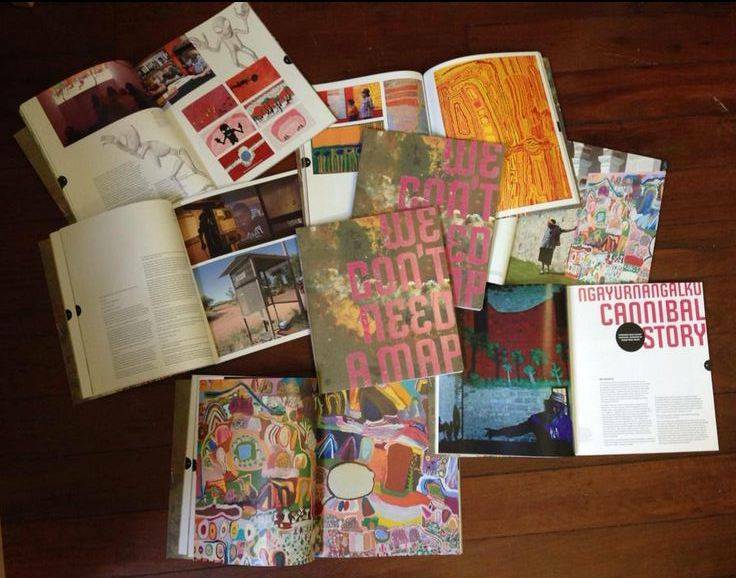 We don't need a map's exhibition catalogue! 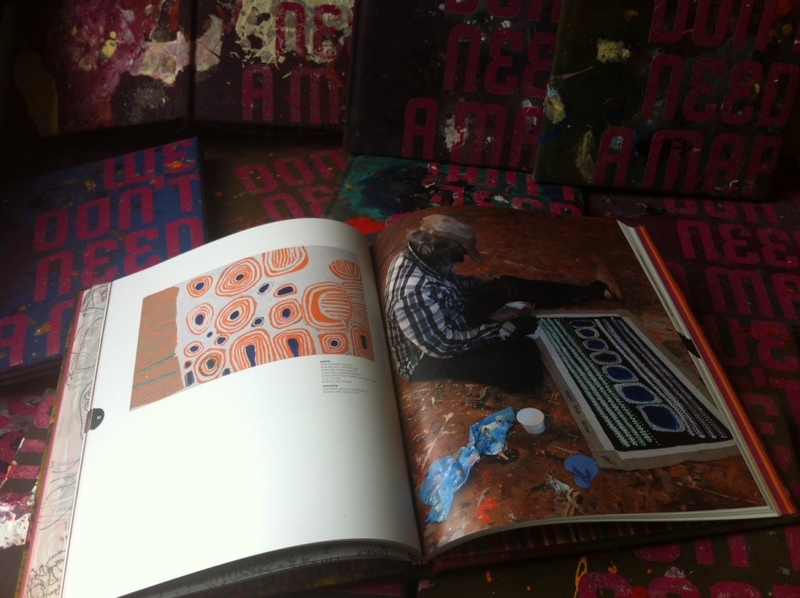 A new edition of We don’t need a map’s exhibition catalogue is now making its way around Australia! 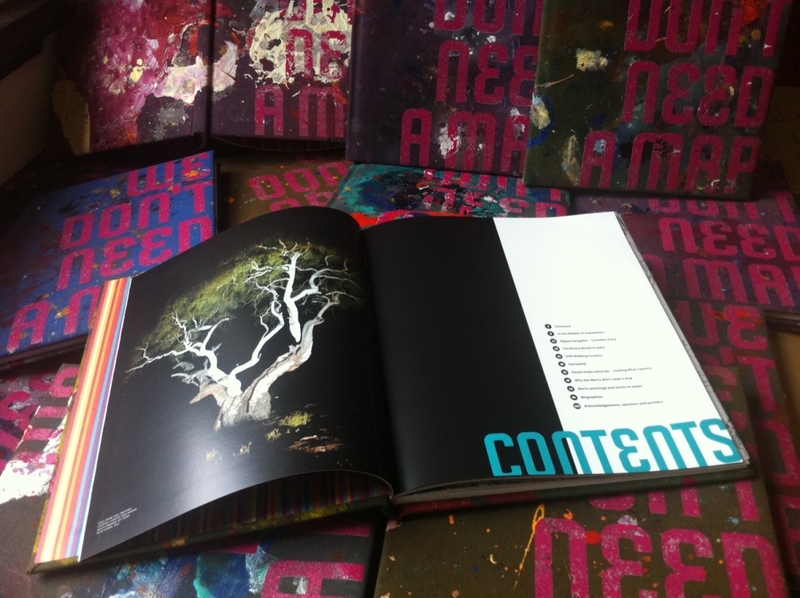 The second edition features new content and some superb images from the original exhibition at FAC. 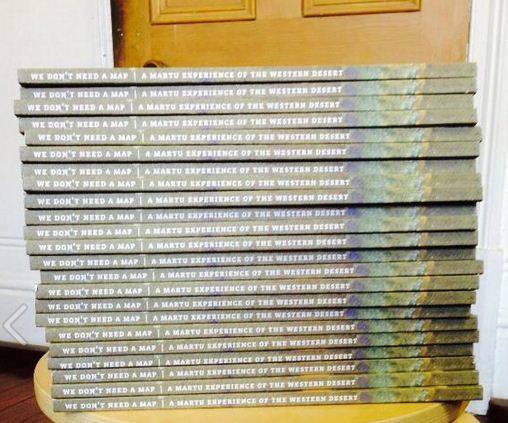 We have republished this book as a part of the national tour of We don’t need a map, and it will be distributed to all venues on the tour, including its next stop at Blue Mountains Cultural Centre opening on December 6th, get your copy before they run out! The senior Martu artist Mabel Wakarta, who has been collected nationally and exhibited in We don’t need a map, was featured this week in Design Satellite’s Artist Profile. 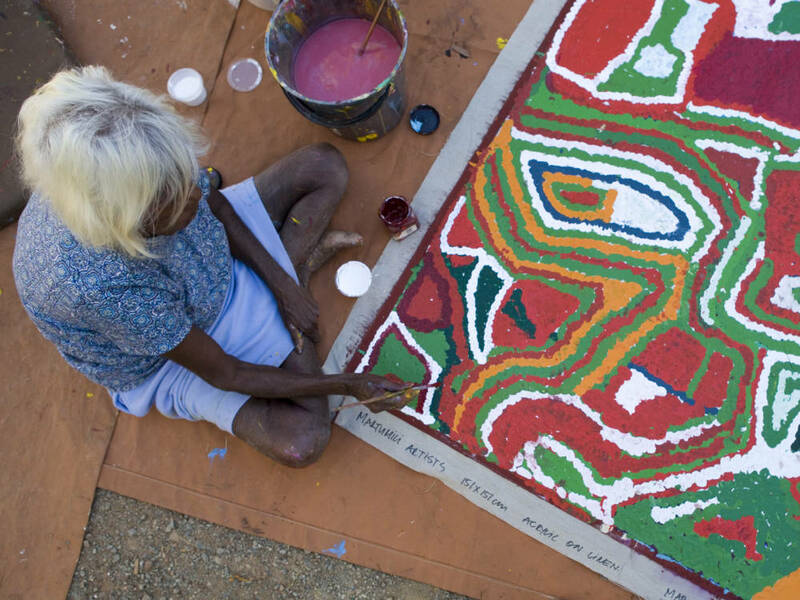 Accompanied with vibrant photographs by Bo Wong this article provides a thoughtful insight into the life and work of Wakarta, one of the most prolific Martu artists living in the Pilbra today, well worth a look! There's more good news for Cannibal Story. The animated short film will be screened at the Boomtown Music & Film Festival in Texas next month. Congratulations to the filmmakers Yunkurra Billy Atkins and Sohan Ariel Hayes. We're thrilled to announce that Cannibal Story has been accepted into the 2014 Flickerfest Short Film Festival. Yunkurra Billy Atkins' Cannibal Story brings to life the dangerous carnivorous beings that live beneath a salt lake in the heart of WA's Western Desert. 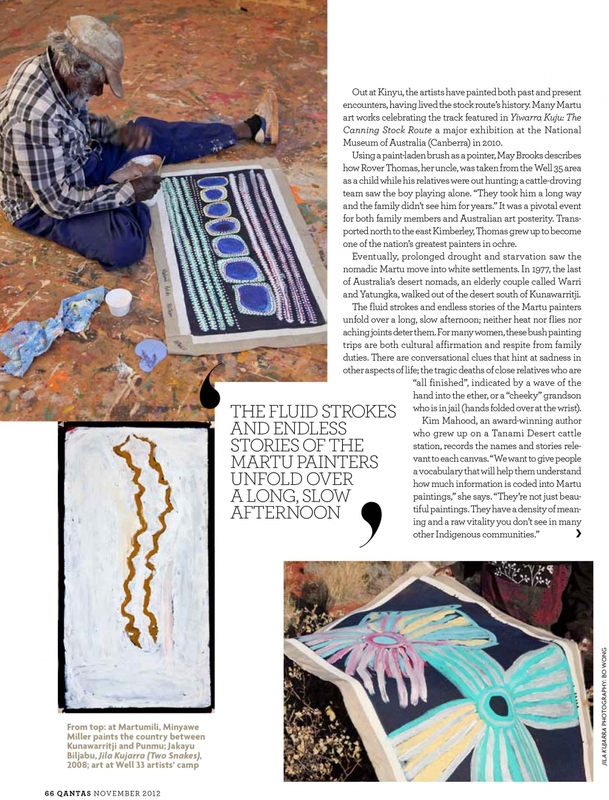 This is Martu artist Yunkurra's country. 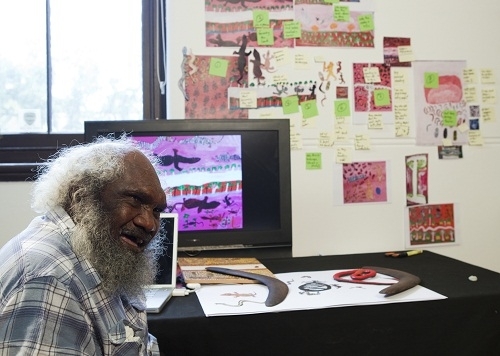 A collaboration between Yunkurra and animator Sohan Ariel Hayes, in 2013 Cannibal Story was nominated for a WA Screen Award and was screened at the Edinburgh International Film Festival, Origins: Festival of First Nations in London, Same but Different: Experimentation and Innovation in Desert Arts II, COFA at the University of New South Wales and at the ISEA 19th International Symposium on Electronic Art in Sydney. Flickerfest runs from 10-19 January in Sydney before touring the country and coming to Perth, Broome and Denmark in March. 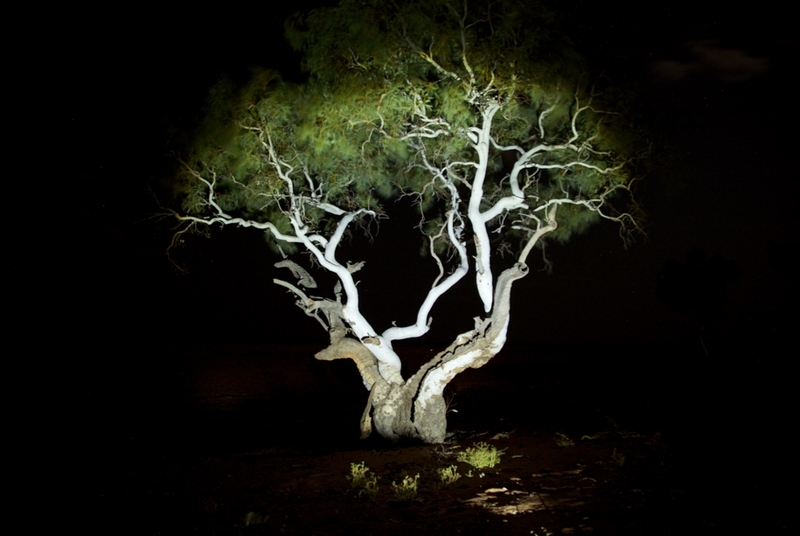 Fremantle Arts Centre is proud to announce in partnership with Martumili Artists, Kanyirninpa Jukurrpa and BHP Billiton Iron Ore that they are the winners of the Creative Partnerships Partnering Award for the major exhibition We don’t need a map: a Martu experience of the Western Desert. 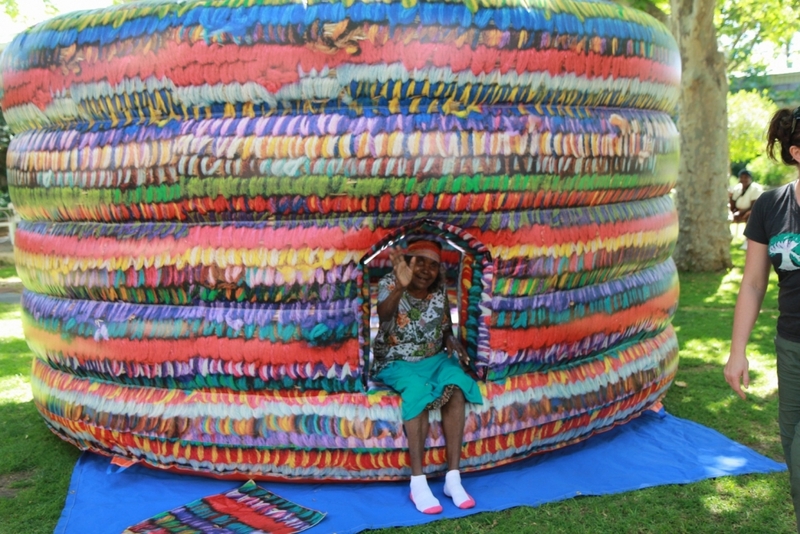 Announced on Wednesday night at the 2013 WA Creative Partnerships Australia Awards at Government House Ballroom, the award recognises the extensive and successful four-way partnership these parties entered into to bring the Martu community’s contemporary art to a wider audience. 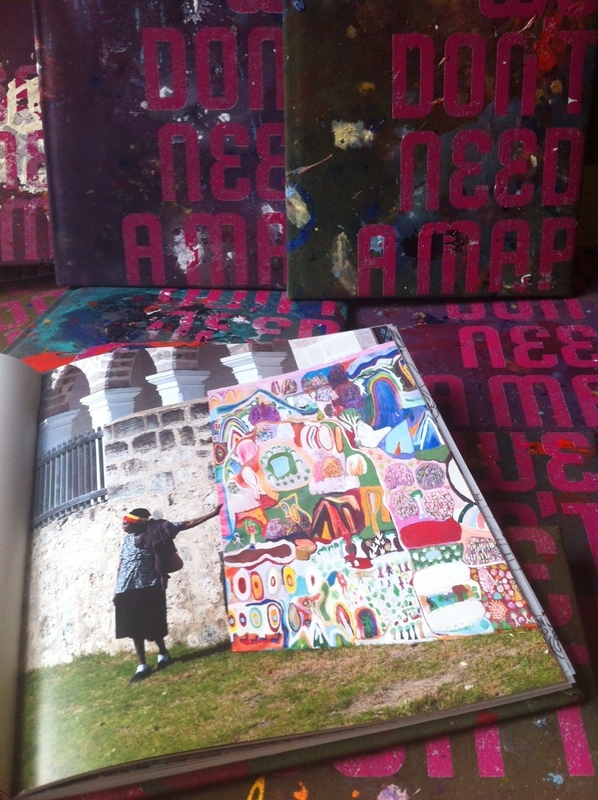 Presented at FAC in late 2012, We don’t need a map was a popular and critical success attracting more than 23,000 visitors, the record number of people to ever attend an exhibition at FAC. We don’t need a map also featured an extensive public program including talks by the artists, curators and anthropologist Professor Robert Tonkinson as well as live music from The Pigram Brothers and film screenings. We're thrilled that Yunkurra Billy Atkins' short film Cannibal Story has been nominated for a WA Screen Award in the Best Animation, Short Form, category. 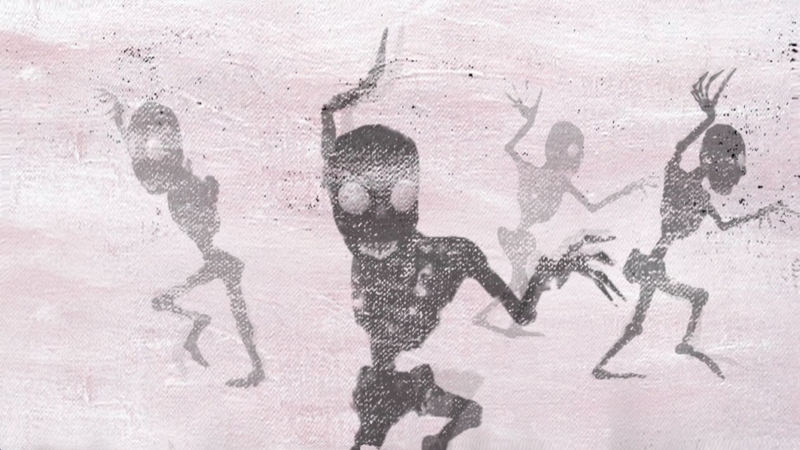 A collaboration between Yunkurra and animator Sohan Ariel Hayes, Cannibal Story was screened at FAC in January this year as part of We don't need a map. There was another great review of Cannibal Story in RealTime this month. Read it here. If you loved We don't need a map make sure you don't miss 33. This exhibition shares the work of three women from Kunawarritji (Canning Stock Route Well 33) - Nora Wompi, Bugai Whyoulter and Nora Nungabar. 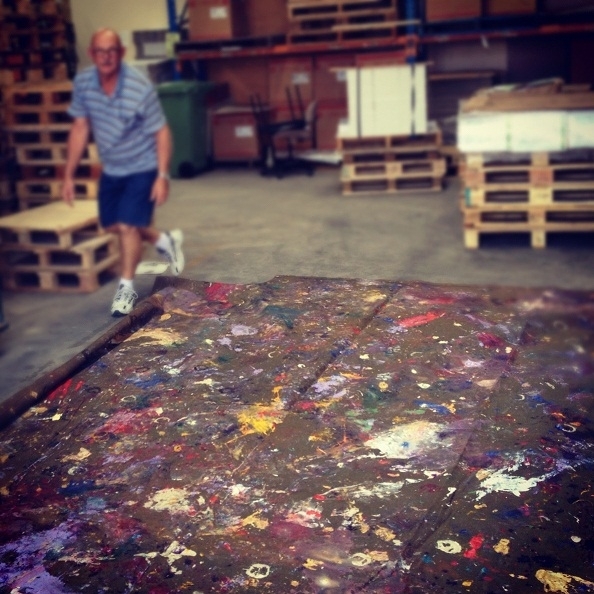 The work is energetic, raw and expresses the artists' desire to celebrate their country through the creation of fantastic works of contemporary Australian art. 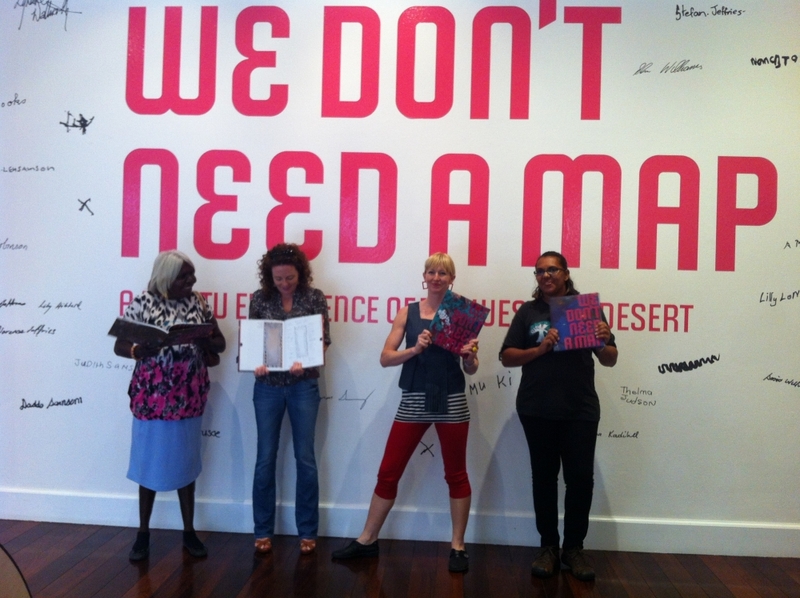 33 also gives a deeper insight into the artists’ practice following their participation in the highly successful exhibition We don’t need a map: a Martu experience of the Western Desert. 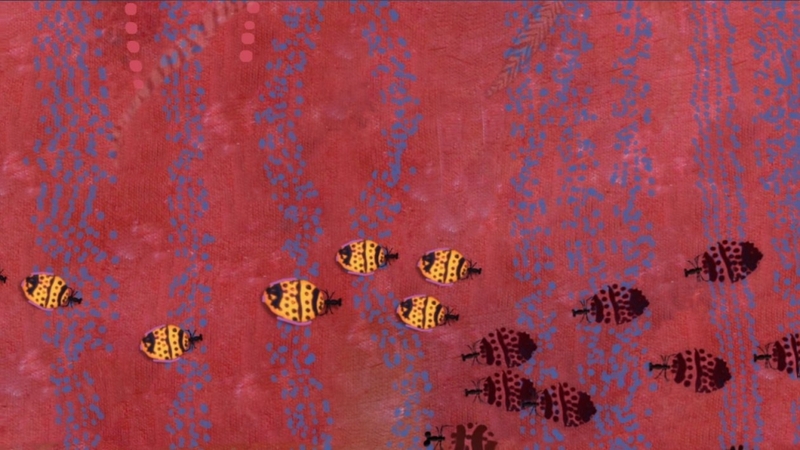 The exhibition coincides with Nora Wompi’s inclusion in the WA Indigenous Art Awards at the Art Gallery of WA. 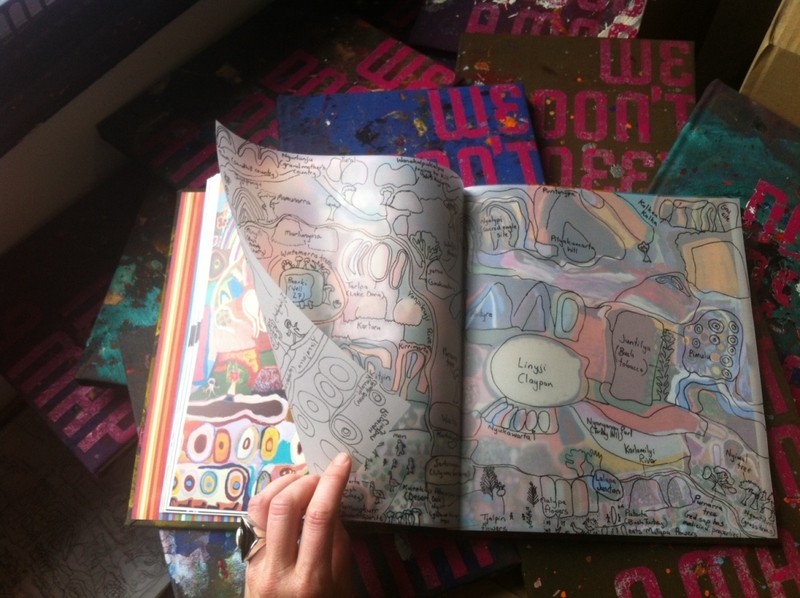 Wompi will also be at FAC for the opening of 33. 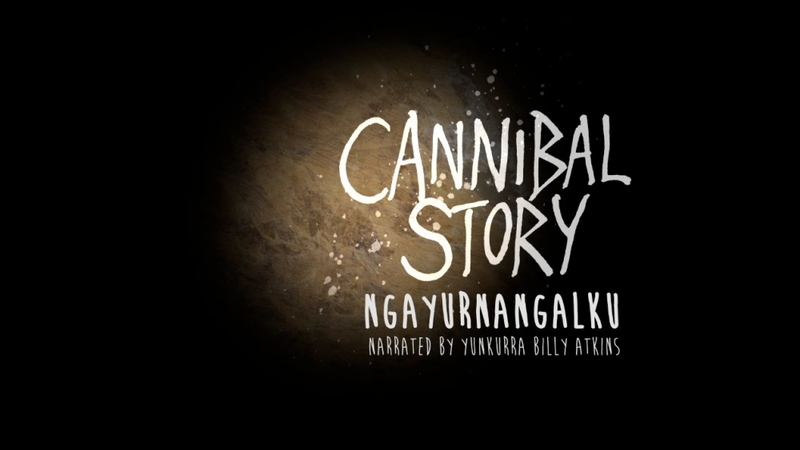 Fremantle Arts Centre and Martumili Artists are pleased to announce Yunkurra Billy Atkins’ animated film Cannibal Story has been officially selected for this year’s Edinburgh International Film Festival. 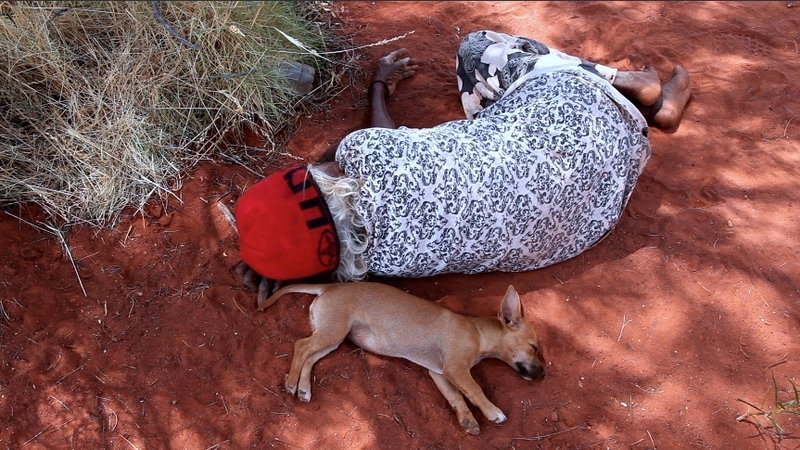 Originally shown as part of the exhibition We don’t need a map: a Martu experience of the Western Desert at FAC in January 2013, Cannibal Story will be screened at the prestigious film festival in June marking its world cinematic premiere. Created by Billy Atkins in collaboration with award-winning animator Sohan Ariel Hayes, Cannibal Story brings to life the paintings of the Martu artist, telling the story of the dangerous, carnivorous ancestral beings that live beneath Lake Disappointment in the heart of Western Australia’s Western Desert. Cannibal Story was screened at the University of New South Wales College of Fine Arts - Same But Different artist’s forum earlier this year and will be shown at the International Symposium of Electronic Art in Sydney next month. A big thanks to cinematographer and editor Dave Wells who put together this brilliant video of We don't need a map. It really captures the energy of the exhibition. 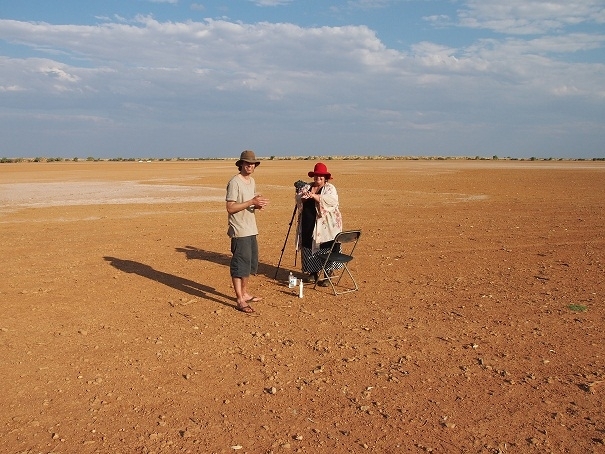 We don't need a map: a Martu experience of the Western Desert from Fremantle Arts Centre on Vimeo. 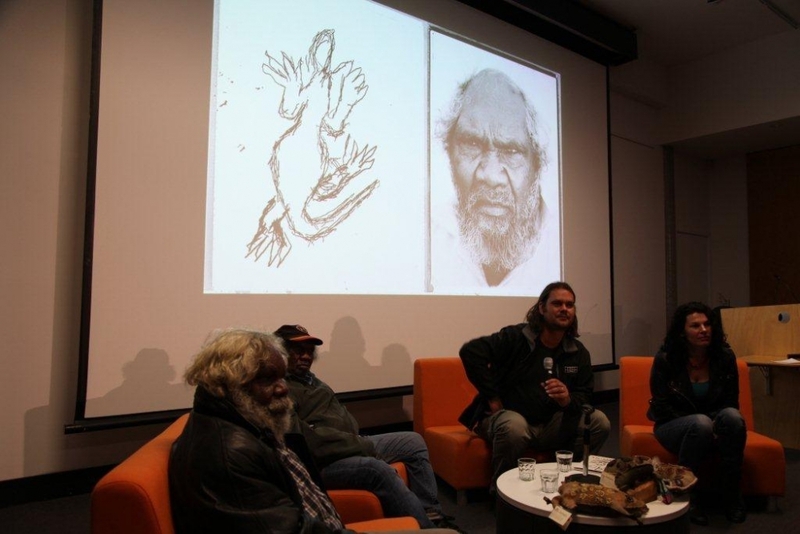 Martu artist, Yunkurra Billy Atkins was recently in Sydney to present his animation Cannibal Story as a part of Same but Different: Experimentation and Innovation in Desert Arts II. 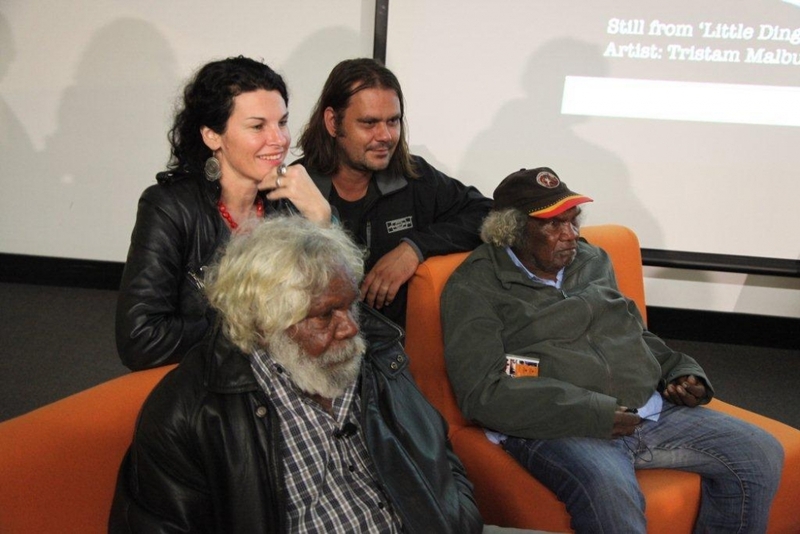 The animation was also shown the week before in Alice Springs and Yunkurra was interviewed on NITV. What a star. This truly is a unique opportunity to hear one of the country's most respected anthropologists discuss his life's work. In the final week of We don’t need a map: a Martu experience of the Western Desert join acclaimed WA anthropologist Professor Robert Tonkinson and arts writer Darren Jorgensen for an in depth and engaging discussion about Martu life and culture. Prof Tonkinson has been working with the Martu, some of whom are participants in We don’t need a map, since 1963. His research and personal experiences provide a unique and invaluable insight into the Martu’s way of life. 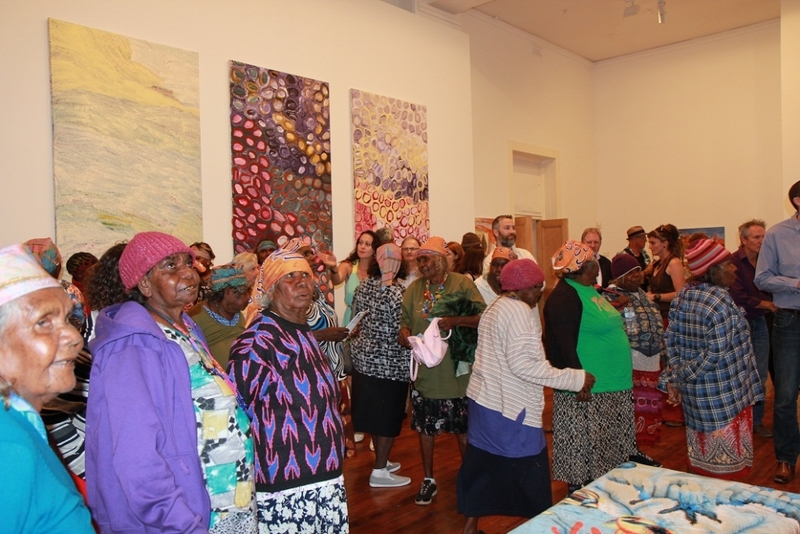 The evening will also include a very informal and relaxed gallery tour with senior Martu artists Nancy (Nyanjilpayi) Chapman, Minyawe Miller and Mulyatingki Marney along with We don’t need a map co-curator Erin Coates (Fremantle Arts Centre Exhibitions Coordinator) for an informal gallery tour. Join acclaimed WA anthropologist Professor Robert Tonkinson for a fascinating discussion on Wednesday January 16 in FAC's Inner Courtyard. Prof Tonkinson has worked with the Martu since 1963. His research and personal experiences provide a unique and invaluable insight into the Martu’s way of life. Joining him will be arts writer and lecturer Darren Jorgensen. 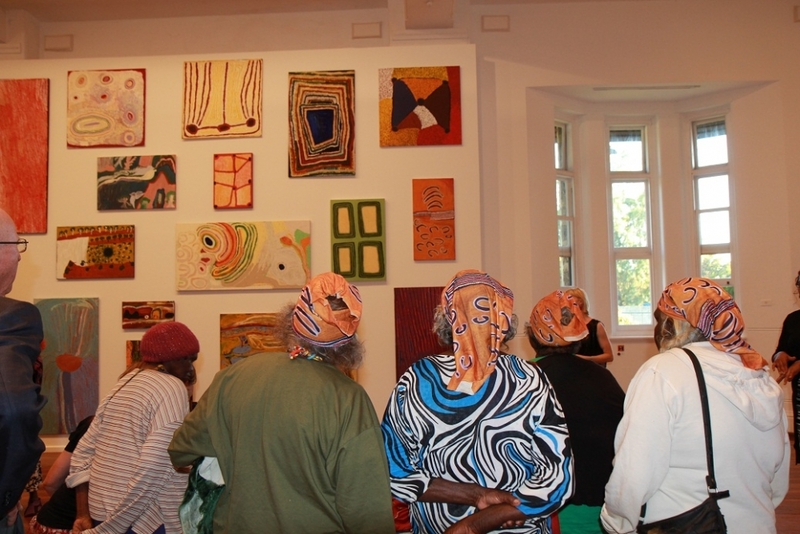 There will also be an informal gallery tour lead by Martu artist Curtis Taylor and We don’t need a map co-curators Kathleen Sorensen (Martu cultural consultant) and Erin Coates (Fremantle Arts Centre Exhibitions Coordinator). Like the opening on We don't need a map couldn't have been bigger, it was also the launch of our very special exhibition publication. These 100-page hardcover books arrived hot off the press the hour before the opening and we are all thrilled with them. 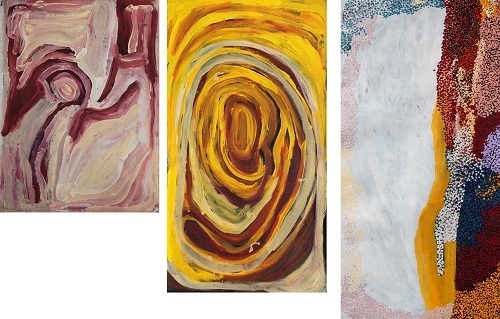 Each book is unique, being covered in a piece of canvas cut from the ground tarpaulins the Martu artists use when painting in country. 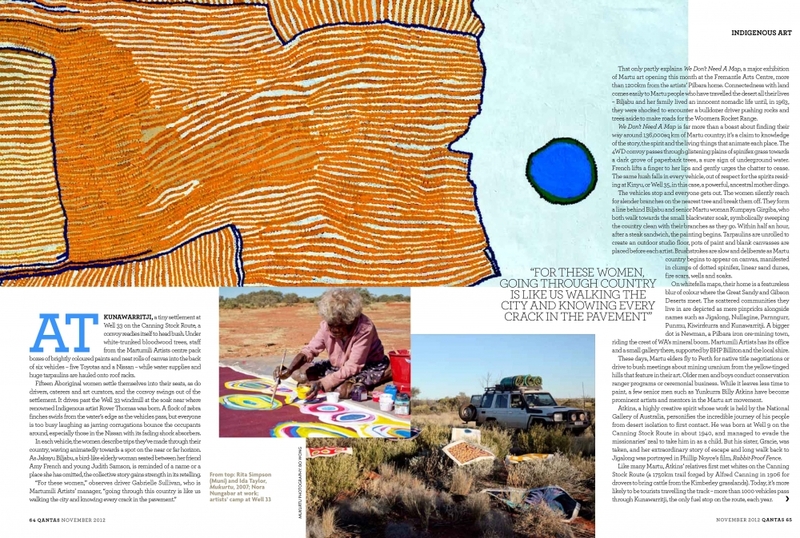 Included in the book is a transluscent overlay giving interpretive information on Amy French and Lily Long's incredible 3 x 5 meter Karlamilyi painting, images of all of the artworks, portraits and biographies of the artists, rangers and other contributors, and photos from Martu country. There are also seven specially commissioned pieces of text: 'In the Middle of Somewhere'; by co-curators Erin Coates, Kathleen Sorensen and Gabrielle Sullivan; 'Cannibal Country' by John Carty; 'The Phone Booth Project' a conversation between artists Lily Hibberd and Curtis Taylor which took place between two remote Pilbara payphones; 'Still Walking Country' an artist statement by Lynette Wallworth; 'Karlamilyi' by Amy French, Lily Long and John Carty; Kanyirninpa Jukurrpa - Looking After Country' by Zan King and Peter Johnson. Hurry in to get yours before they all disappear!! 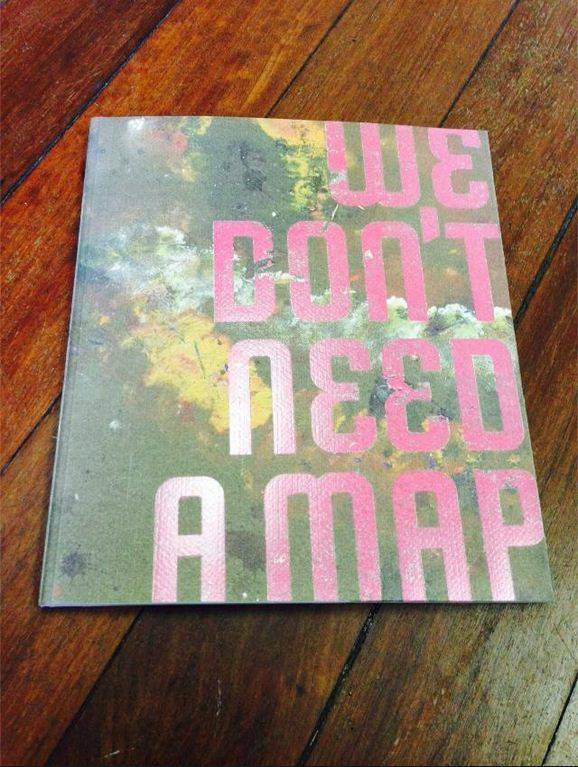 We don't need a map continues to draw people to Fremantle Arts Centre. The exhibition has won acclaim from critics and audiences alike. 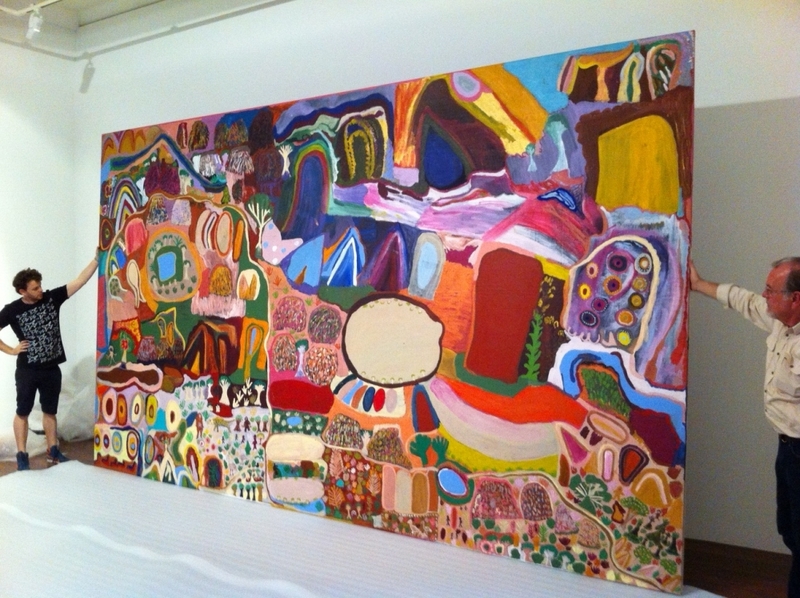 In the past week the exhibition has got great national coverage from the likes of Crickey, Radio National and ABC Arts. A few opening night pics for those of you who couldn't make it. 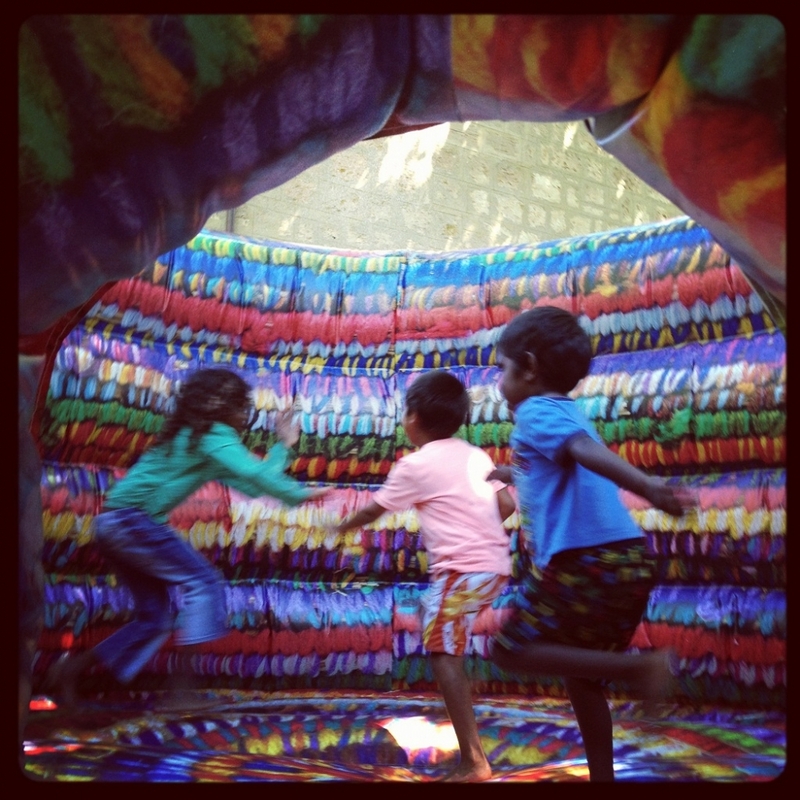 Based on a handmade woven basket by Martu artist Thelma Judson, the giant bouncy basket has been a instant hit. Pop down to FAC for a bounce. The countdown is on. The opening of We don't need a map is only four days away and gallery staff are working around the clock to get the exhibition installed. 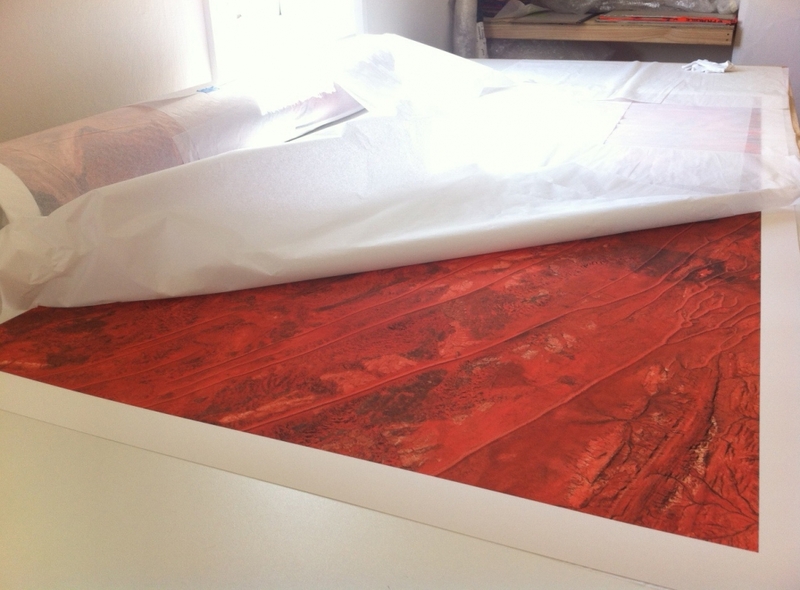 Today the prints arrived of the aerial images of the Western Desert. These large and incredibly high resolution images show four locations specifically connected to paintings in We dont need a map and also reveal the burn scar patterns, sand hill ridges, areas of vegetation and stunning colours of the Martu's country. These images are reproduced by permission of the Western Australian Land Information Authority and have been printed on beautiful Hahnemühle paper by local printer Tony Nathan. 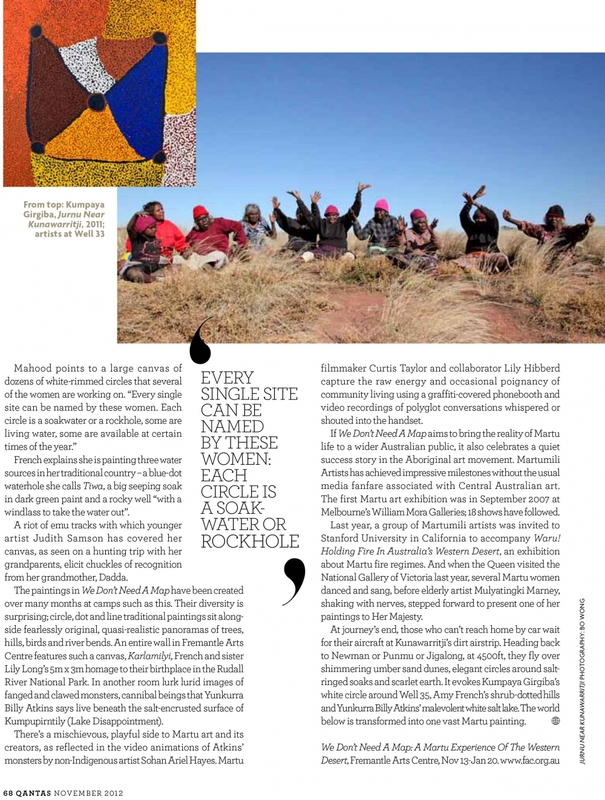 A great article about We don't need a map in this month's Qantas magazine. Now that all the Martu artworks are at FAC and the publication has gone to print we are busy preparing for the install and opening weekend celebrations. In addition to the stunning paintings and works on paper going up on the walls, the install will involve multi-channel projection installations, suspended structures, sound works and much much more. 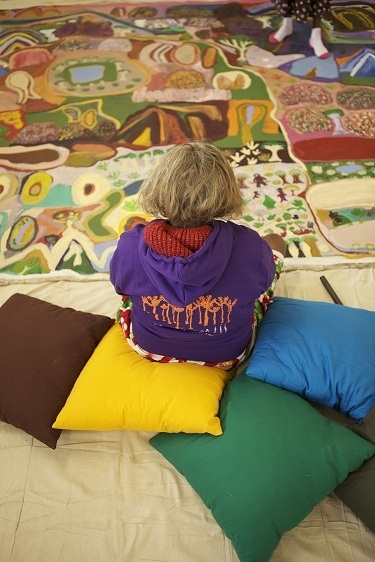 As a part of the innovative interpretivite material in We don't need a map Amy French and Lily Long's gorgeous 5 x 3 meter Karlamilyi painting will be accompanied by audio of the artists singing their country and an interpretive diagram. 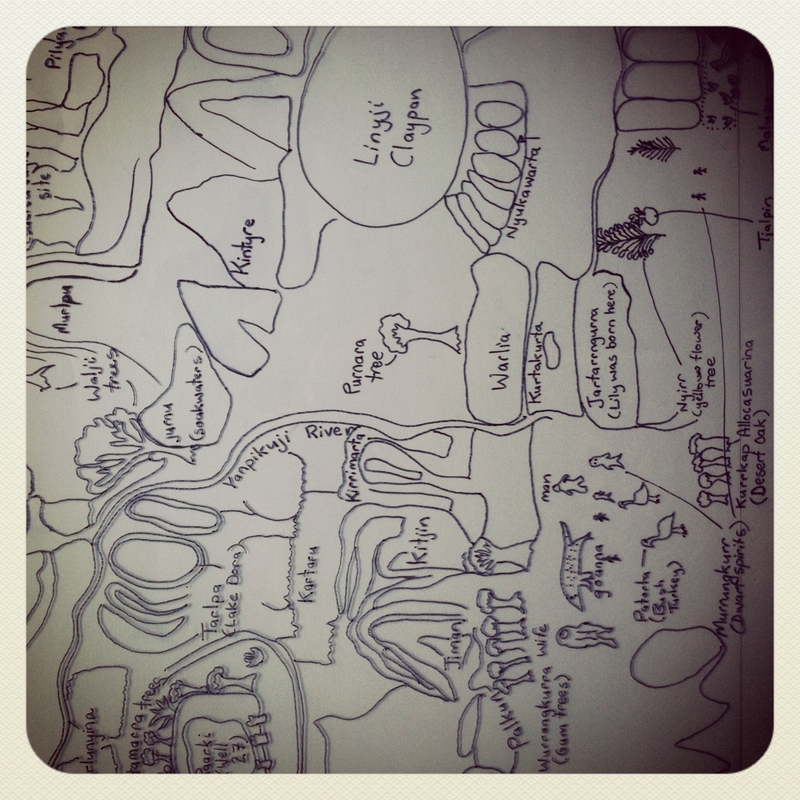 This image shows a small section of the drawing that Amy and Lily helped writer/artist Kim Mahood create to reveal some of the fascinating knowledge embedded in this signigicant painting. We are in full production with the soundtrack for Yunkurra Billly Atkins' animation soundtrack. The artist was in the studio with local sound desinger Roly Skender last week to record audio for his extraordinary story about the Ngayurnangalku (cannibal beings) at Kumpupirntily (Lake Disappointment). 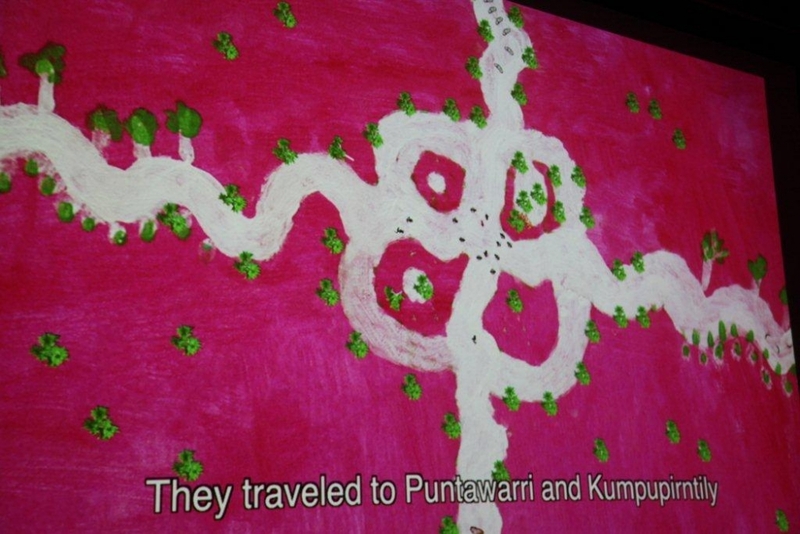 The soundtrack blends Yunkurra's narration with voice overs from other Martu, singing and field recordings from country. 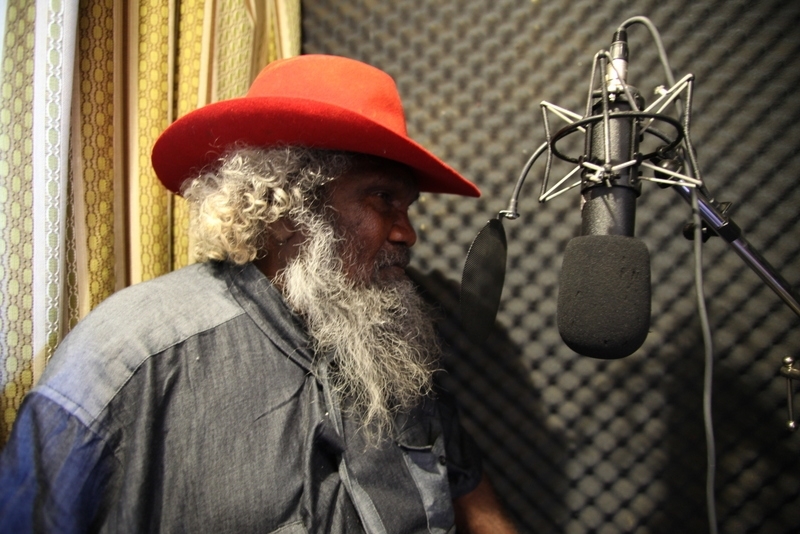 This is not Yunkurra's first time in the recording studio - he has previously made a hip-hop track with the Morganics called 'Jigalong, That's My Home'. 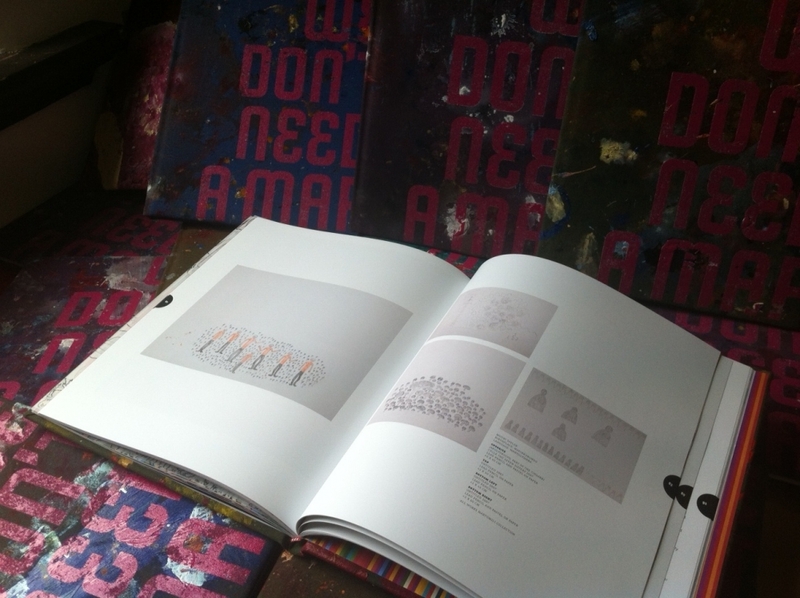 The limited edition We don't need a map publication goes to print this week. 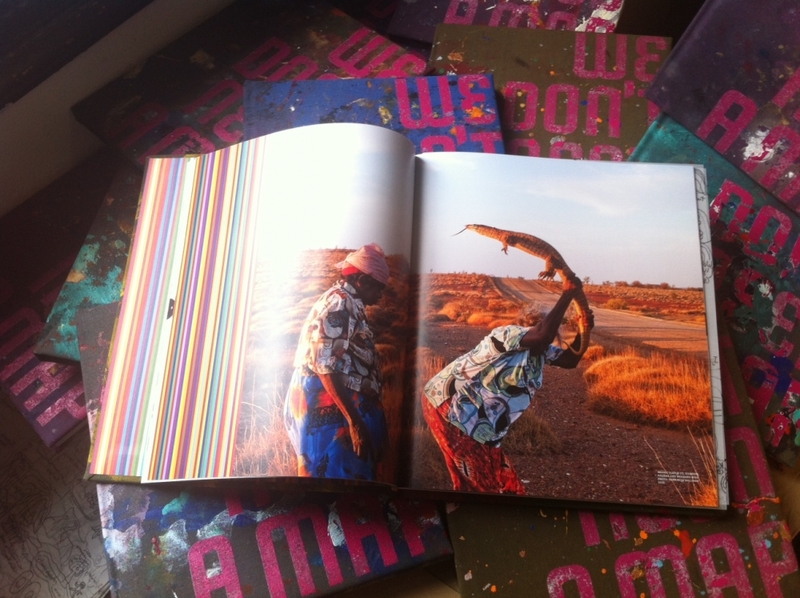 These beautiful one of a kind books (only 600 will be produced) will be bound in the paint-splattered tarps the Martu artists sit on when they're painting. 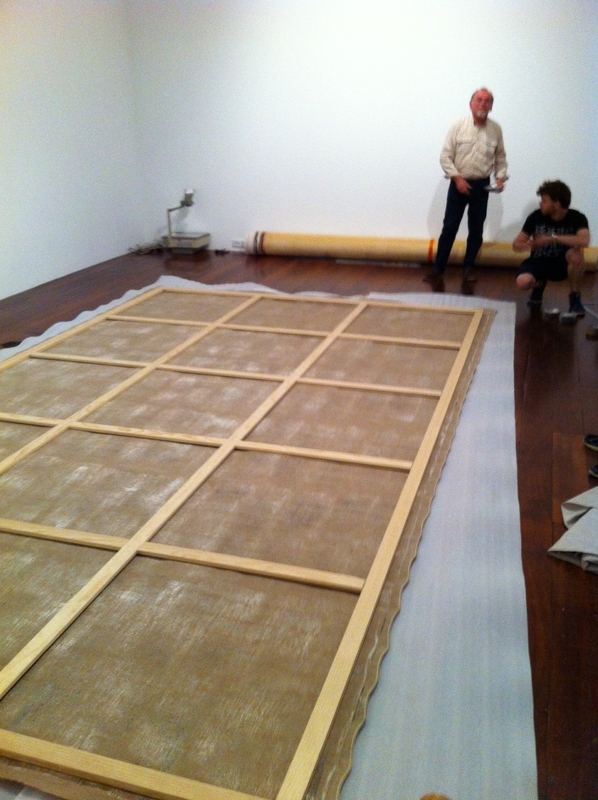 We dropped in to the book binders' workshop last week and the tarps from the Western Desert had arrived. Covered in red dirt and dog hair, they looked great but were in need of a wash. 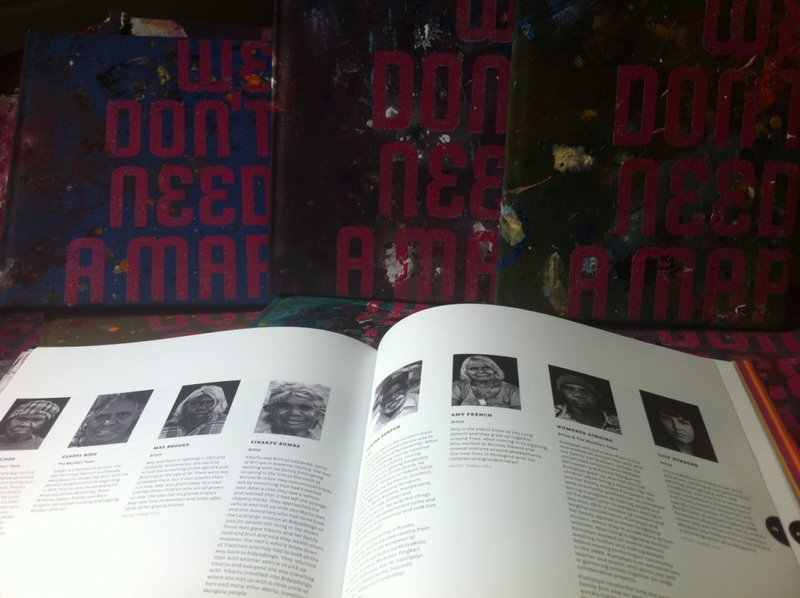 The We don't need a map team can't wait to see the final publication. 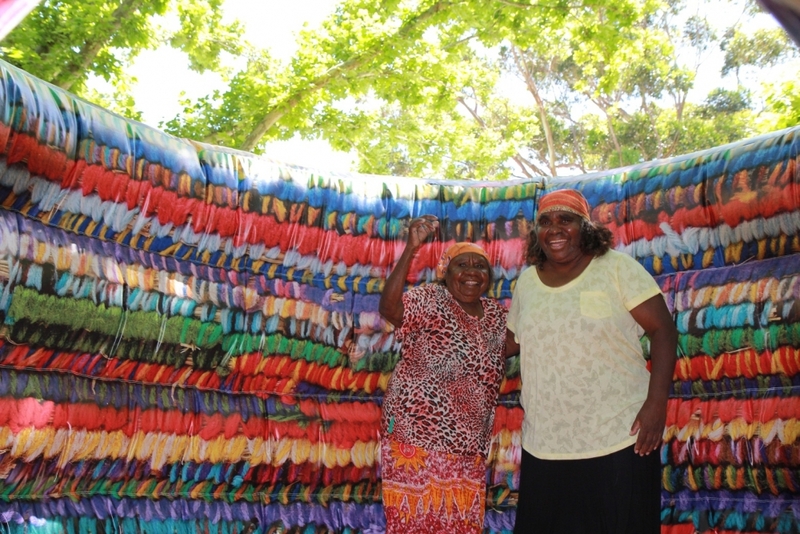 "It was an incredibly generous invitation, to come and visit Martu country. We just went and picked up seven of the women and went out camping with them. We weren’t really in the community at all, we were just out there hunting and I was filming. I brought Pete Brundle who works with me and we filmed as much as we could. We were out for about 6 days all up. They are master hunters. They hunted goanna, bush turkey, they found acres of bush tomato and bush onions. What was clear was the abundance apparent to them in a landscape that looked barren to me. One day they come back with 36 goannas from a few hours hunting. It was really incredible watching them burn the Spinifex and then track and find the goanna in their holes. 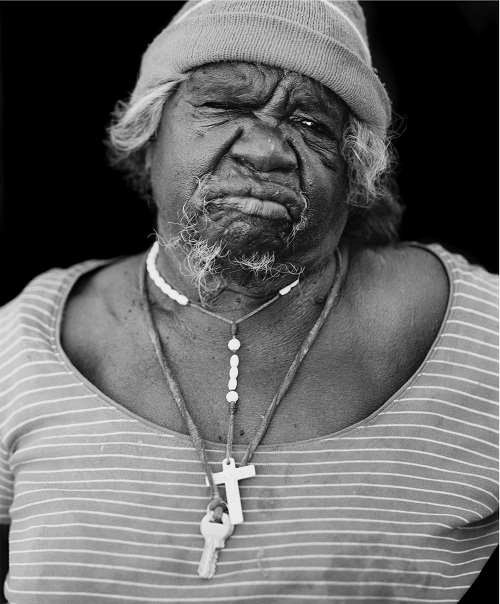 I had been to the Oak Valley community which is on Maralinga land in South Australia but I had not been out like this – going away from the community and hunting and sleeping out. I didn’t feel isolated at all because the women know the country so well. They know everything about it. Every place we visited they knew intimately.They talked about where we were and how they’d experienced it as young people. They sang the songs of the place. They’d been coming to these places for a very long time. The oldest woman was in her 80s and the youngest in her 20s. What was surprising to me was to discover that this is not historical, this is contemporary, this is how they’re living. That disconnect which we assume has happened everywhere across the country does not seemed to have happened for the Martu people and that was the most astounding thing to witness – how their connection to this place, this country we were in, was seemingly unchanged. They were moving through their country, returning to paces, hunting in places, much like their parents and grandparents had. That was what surprised me. Knowledge of these dunes and clay pans had been passed down to them and is still being passed down. It was a revelation. I’m really interested in trying to show that there’s no disconnect with hunting, gathering, land management practices. 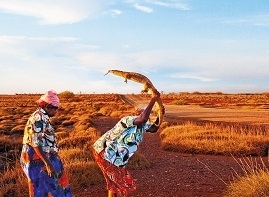 There is no identity loss from traditional Martu culture for the women I met and travelled with. It’s a contemporary, living culture. Showing parallel worlds and parallel cultures is something that I’ll strive to do in the work because that was the most prevalent sensation I came back with." 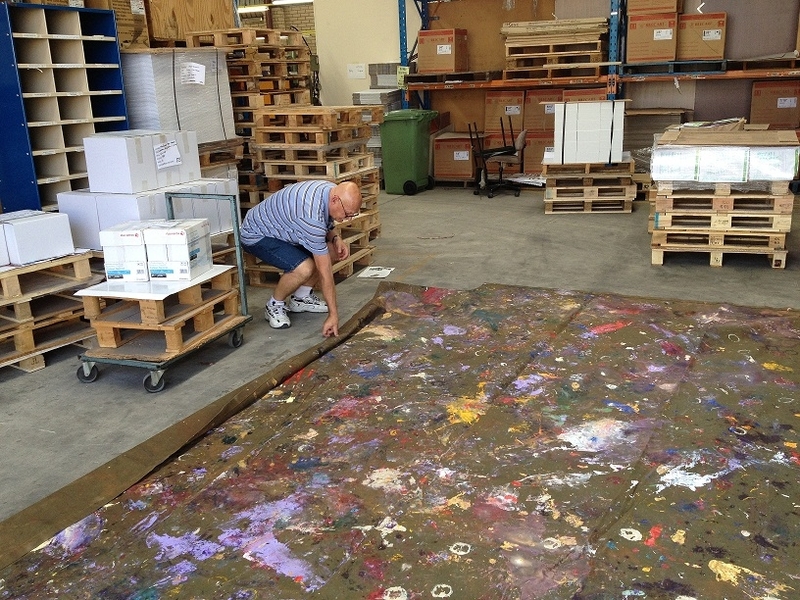 The excitement mounts at FAC as we receive the final paintings and the collaborative projects reach their end stages. Last week we received this beautiful work by Mulyatingki Marney and Jakayu Biljabu, which has been brought across from a collection in Sydney. 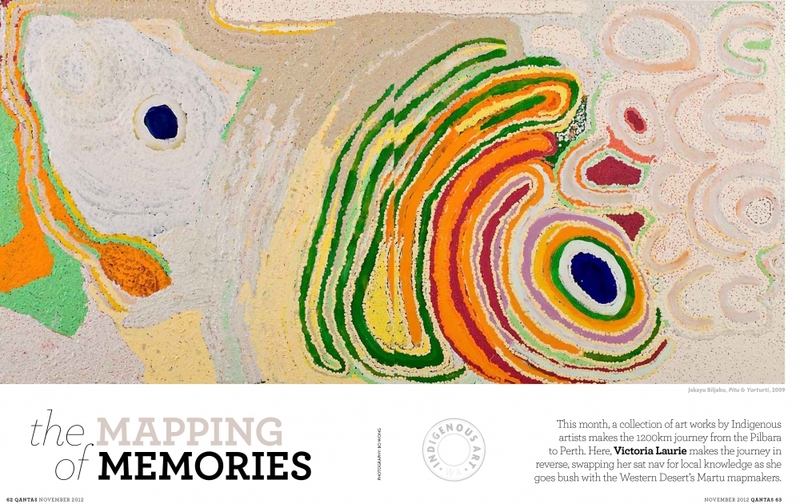 Martu artworks have found their way around the globe and in November this exhibition will bring a stunning selection of them back together with the Martu artists who made them. 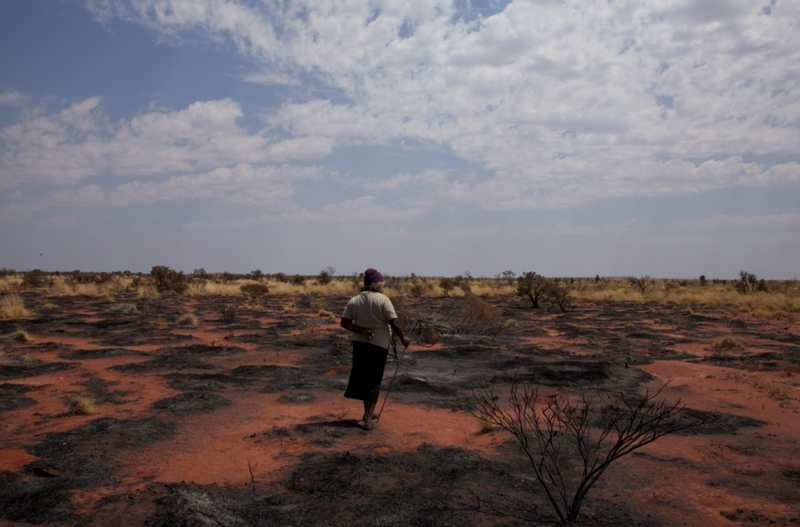 Welcome to We don't need a map: A Martu experience of the Western Desert. Bringing the desert to the city, We don’t need a map is a major new exhibition celebrating the distinct and joyful visual language of the Martu and their connection to Country. This expansive exhibition, provides a nuanced insight into Martu life and cultural practice, capturing the humour and spirit of the Martu people and providing an opportunity for urban audiences to immerse themselves in the sights, sounds, smells and tastes of desert life.